“Sleeping Beauty” tells the wondrous tale of a princess cursed by an evil fairy, protected by three loving fairies and, ultimately, saved by “true love’s kiss.” Featuring the voice talents of renowned opera singer Mary Costa as Sleeping Beauty and Disney stalwart Eleanor Audley as the evil fairy, Maleficent, the film’s vibrant visuals were created by a team that included Milt Kahl and Ollie Johnston, two of Disney’s legendary Nine Old Men and an Academy Award®-nominated score, 1959, adapted from the incandescent music of Peter Tchaikovsky. “Sleeping Beauty” is the sixteenth animated feature in the Disney animated features canon and was the last animated feature produced by Walt Disney to be based upon a fairy tale. It is the tenth film released as part of Disney’s prestigious Blu-ray Diamond Collection. Creating the ultimate at-home viewing experience, Disney’s 2-Disc Diamond Edition Blu-ray Superset (Blu-ray + DVD + Digital Copy) contains digitally restored picture and sound, a digital copy of the film, and a variety of magical new bonus features, including “Once Upon A Parade,” in which “Modern Family” star Sarah Hyland tells us the tale of Walt Disney World’s new Festival Of Fantasy Parade, “Art of Evil: Generations Of Disney Villains,” a legacy piece spotlighting Disney’s favorite villain animator and Maleficent creator Marc Davis, and “@DisneyAnimation: Artists in Motion,” in which Walt Disney Animation Visual Development artist Brittney Lee goes through the process of creating a three dimensional sculpture of Maleficent, completely out of paper. Additional all-new bonus features include never-before-seen deleted scenes “The Fair” (with Deleted Character The Vulture,) “The Curse is Fulfilled” and “Arrival Of Maleficent,” plus the Beauty-Oke sing-along to “Once Upon A Dream.” The Blu-ray Superset also includes classic DVD bonus features and more! I don't remember ever seeing this movie. I know it most likely played on tv a bunch of times when i was a kid but I really don't remember ever seeing it. I watched it yesterday and I did enjoy it and loved the bonus features which includes never seen before deleted scenes and I actually did enjoy the movie. I have no clue why I haven't seen it before (if I did I do not remember). It is well done and I am so glad that I watched it. I am so glad I received this to review and it will be added to my Disney collection for sure. If you have a child who loved Disney movies or if you want to add it to your Disney collection than it is time to do so now because this will be available for a limited time only. 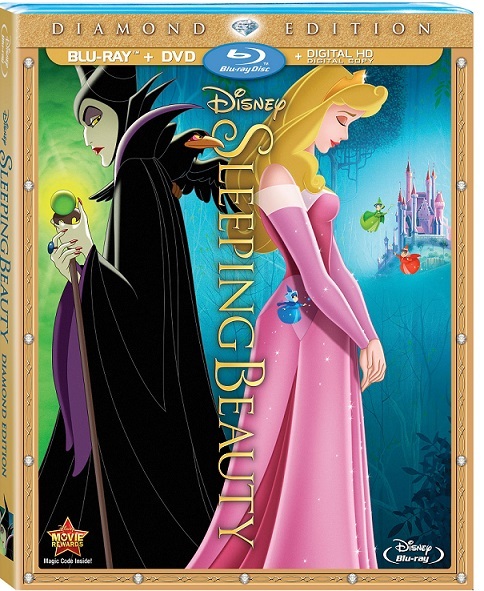 Sleeping Beauty Dianmon Edition is available now online and in stores near you.